What better way to start the Easter break... 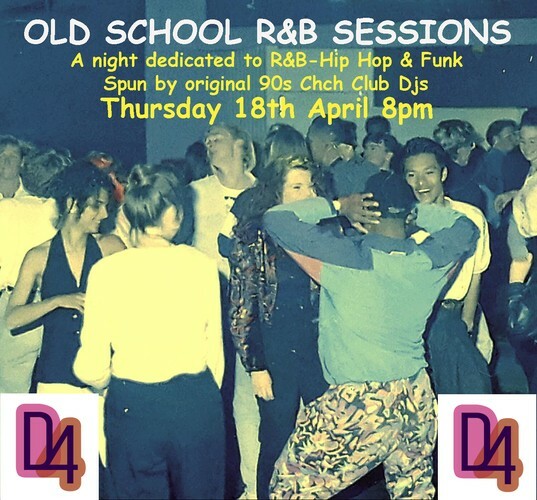 This is your chance to relive & experience the sound of R&B, Hip Hop, Funk and all tunes with soul played during the 90s in Chch's club scene. A night dedicated to those who like a good strut on the floor to the classics not heard that often anymore. Our Djs have a background playing at iconic 90s Chch clubs such as "The Palladium" and "Cats". The flyer pic is from Cats, Manchester St, 1992! D4's Old School DJs have individually 30 plus years each to bring to the party, so expect everything you remembered or heard and more. Get ready to dress up to get down to the funk.